In their first major event since the split was announced in January, a reinvigorated Xerox held an analyst briefing in Rochester this week to showcase their 14 newly launched “i-Series” of copiers / MFPs. Suits and ties replaced the casual dress of not just Xerox executives, but all Xerox employees that were part of this event. I’m pretty sure the local stores had a run on ties in the last week and I know for a fact at least one guy there had to run out and buy a suit. I liked it though. Dress for success and look professional. Most of us have become pretty relaxed these days (I was teased at the dinner for not tucking my shirt in). These guys reminded me of how things used to be at Xerox. It was classy and old school. The event began with a nice dinner where we got to network with colleagues and Xerox execs. It was great catching up with people I haven’t seen in years and meeting those who have joined this group since their last briefing. The next day began bright and early at the Gil Hatch Center for Customer Innovation on their Webster campus (outside of Rochester). This is an incredible facility bearing the name of a dynamic Xerox leader and it’s one of the few places where you can see everything they have to offer under one roof. We started off with a Keynote from author Alexandra Levit who discussed the future of work to 2025 and beyond. A nice tie-in to the day’s announcements. Then, Jim Rise, SVP of the office and solutions group spoke about the office market and Xerox’s strategy. There’s still a lot of opportunity here and apparently not everything is as doom and gloom at Xerox as Wall Street might have us believe. Color MFPs have continued to be a bright spot and Xerox even shared market share info showing they’re number one in market share in many areas. So what’s new with the i-Series? It’s all about the UI. Xerox has completely overhauled the touch screen and added a new button for the Xerox App Gallery. Finally! I have been on Xerox (and everyone else) for YEARS to add an app store to their UI. Look at your phone. How many apps would you have if you didn’t have that button on your phone where you could find new apps? Probably none. Xerox has placed several free apps in this store that customers can install on their own. The process is as easy as it is on a smart phone. The free apps are connectors to things like Dropbox, Sharepoint, etc. There are no “paid” apps in this store at this time, nor are there any immediate plans for any. Xerox has taken the first step down a path that all printer companies should be walking on. They have all been pushing solutions for year. Essentially, we now have a TV screen that customers walk up to several times a day. If I walk up to that machine every day for five years, at some point I am going to press that app store button, just to see what’s in there. Why in the world would you not put demo apps and free trial apps in that store? Organize it vertically. Put your catalog in front of the customer. Organize it so that it doesn’t overwhelm them. Take 10 minutes and look at the Apple App Store. Do that. If I’m an IT director at a law firm, do you think that copier will sit there for five years without me eventually looking at the app store? If there’s a “legal customer” button in that store, do you think I might click that next? Maybe that IT director sees a Y Soft connector in there and says to herself, “hey, we use Y Soft, no way! I should get that app! The Xerox App Gallery is a great start. I’d love to see them continue to fill it in a way that allows them to effectively monetize it. Where do the apps come from? Xerox has created an excellent program for just that purpose. Xerox App Studio 3.0 gives channel partners the ability to create their own apps. Several Xerox resellers are now generating revenue off these apps, not just from end user customers, but also from other Xerox channel partners who are now licensing these apps. 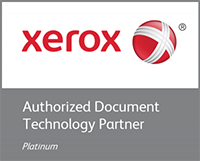 If I got this right, Xerox now has 2,500 partners who have developed about 13,000 apps. They flew another partner all the way from Sweden to talk to us about their app development strategy. Stefan Nilsson of Foxway told us in a break out session that he expects to be bringing in $500,000/month from revenue earned off apps within three years. In a world full of shrinking print volume, it’s great to find another revenue stream, especially a recurring one. This channel partner is going to be bringing in $6 million a year in three years from apps. Once they’re developed and out there, that’s pretty much it other than occasional updates. Sounds pretty profitable to me. The new UI is also nicely laid out and very basic. It’s not exactly like a smart phone or tablet, but it’s simple and simple is good. Xerox also showed a new mobile printing capability for the i-Series. The @PrintByXerox app is a free mobile cloud printing service that let’s people print from their phone, tablet or laptop using email as the delivery mechanism to the printer. This is similar to an approach another company has taken but Xerox has made it even easier to use. Simply forward your document, email, photo or webpage on your phone to the email address. The document goes to a cloud server where it sits until you use the QR code on the Xerox MFP to release it. You walk up to the machine, authenticate, and then use your smart phone QR reader to release the job. Simple and it can be done from any connected Xerox device in the customer’s ecosystem. There is a free version of this and a premium that gives customers a higher level of control over users. One of the unique apps we saw in action was the Xerox Easy Translation Service app. Scan your document and choose the language you want it converted to and it prints in the updated language. There is a more sophisticated level for higher level translation that can’t be satisfied with an auto-translator. All ConnectKey enabled MFPs can receive an upgrade to the new user interface. If I were Xerox, I’d use that as an excuse to go back to every single customer. Show them the innovative screen and ask if they’d like their fleet upgraded. How often does a printer vendor make my copier noticeably better without charging me anything? Customers will love this and it will build loyalty when they see how you’re not just there for them every 3-5 years, but you’re actively working to make their experience better. The Xerox split is the best thing that could have happened to Xerox copiers and printers. The people in the technology group want to be the masters of their domain and finally, they will be. For years, all we’ve heard about is the services group, with very little news coming from technology other than horrible earnings and declining sales. It created the impression that Xerox was quietly letting copiers and printers dwindle, as they became something else. This apparently wasn’t the case at all. Who knew? Xerox is not simply refreshing hardware. This briefing was a great reminder of the power of Xerox, the effort they put into R&D and customer research and the great lengths they go to in order to stay innovative. They didn’t just tweak their machines and launch something a little faster, a little quieter. They reinvented the user experience. Like their competitors (maybe even more-so), Xerox faces a lot of challenges as customers and technology evolve. After yesterday, I can tell you Xerox is not dead. They’re fighting and the split seems to have a rekindled an excitement within the company I have not seen in many years. Thanks for the update Xerox, I hope that you provide updates like this more frequently, it was quite an eye-opener.